Rigid PVC Foam board, or Foamex is the board of choice for those looking for something a little more hard-wearing and of a smoother finish than the Correx polypropylene board. 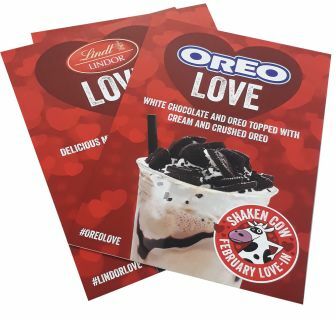 With a smooth bright white finish, and one of the most versatile products of its kind on the market, once printed on our UV cured printers your signs will look the part, eye-catching, bright and clean advertising. It’s suitable for indoor and outdoor advertising as it’s fully water-proof and compared to traditional wooden signage. Widely used for everything from Shop front signage to directional signs in hospitals, to selfie prop's, cut letters and more. PVC is the world’s third most common man-made synthetic fibre, with good reason too. Foamex is also a fire-rated product and is used for a wide variety of final products, from cut to shape boards and props, photo backdrops, hoarding boards, head-hole cut out stands, strut boards and much much more. Our Foam PVC boards are available in three standard thicknesses from stock: 3mm, 5mm and 10mm. 3mm foamex is recommended when you need something more lightweight. Larger panels of 3mm foamex printed can be attached to a shell scheme using Velcro or similar hook & loop systems. 5mm foamex boards are recommended as a mid-range signage material, often used both indoor and outdoor. Indoor applications include wall display panels or art exhibition panels, whereas outdoor applications are mainly: shop signs, advertising boards, building site boards and general signage. 10mm foamex panels are normally used either when more heavy duty printed material is needed or for specialist display products that could fit inside cut out slots, or even cut to shape letters or props. If you are not sure of the right thickness to use for your needs, just get in touch with us and we will help you pick the right product. We will provide the highest quality Foamex printing services that suit your needs, regardless of whether you are interested in standard or custom size Foamex board. We offer large format printing services and can handle single piece prints that are as large as 10x5ft, for anything larger, we are happy to split the artwork across multiple boards for you, just let us know your needs. If you are looking for a straightforward signage solution, then a Foamex sign could be perfect for your requirements. Foamex signs are perfect for both indoor and outdoor use and provide a durable, professional product with outstanding print quality. Foamex signs can be produced in any size and any quantity from one off signs to large production runs. General signage for indoor and outdoor use, i.e. hospital signage, logo photo backdrops, shop signage. Foamex is a popular name for rigid, hard Foam PVC board, with brand names like Forex & foamalite. Foamex does not look or feel like foam material, it looks and feels rather like hard matt plastic. What is foam core (foam board)? What is the difference between Foamex (foam pvc) and Foam core board? Foamex is hard, rigid and suitable also for outdoor use. Foam core is much lighter, has soft foam-like centre and is only suitable for indoor use. Are foamex boards suitable for indoor and outdoor use? Yes, printed foamex boards are suitable for all weather outdoor use as well as indoor displays. What thickness does foamex board come in? The most popular foamex thickness is 5mm. 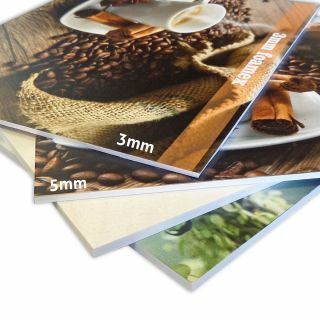 We also stock 3mm foamex in large numbers. Alternatively you can also have 2mm and 10mm foamex (foam pvc) boards. Let us know if you have any special requirements. Where are the foamex signs produced? The foamex signs are printed and produced in our printing factory in Whitefield near Manchester. When will I receive my printed boards? Our standard printing production lead times for majority of orders is 3-5 working days. However, depending on our current production load, and your organisation, we are sometimes able to dispatch faster. Once the production process is complete we offer a next day delivery service to virtually all UK mainland locations. This is a next day service as specified by the courier companies we use, and does come with some limitations, it isn't a guaranteed service due to potential factors outside of the couriers control. For the Greater Manchester area we can also offer a dedicated same day delivery service to deliver your signs immediately after production. This service costs a little bit extra but we strongly recommend dedicated van delivery for large items delivered to local destinations to maximise safety and minimise potential damage (avoiding unnecessary parcel handling and redistribution from depot to depot). Foamcore Boards, lightweight foam centred board, smooth finish printed direct, suitable for indoor use only. Honeycomb Board, or more commonly known brand names Falcon Board or Xanita Board, are made from renewable and 100% recyclable paper, with a honeycomb cellular center which provides thickness, sturdiness and rigidity but allows for a very lightweight product. A Foamed Polypropylene environmentally friendly alternative to Foam PVC. Smart-X is a lightweight sheet material with a core of expanded polystyrene, providing a lightweight but rigid alternative to other printed media with a high quality printed finish. Printing on brushed aluminium composite panels with polyethylene core. Ideal for door plaques and indoor and outdoor signs, durable high resistant rigid media with brushed style finish.